Power up your payment process. The Payment Hub maintains all vendor assigned payment types, manages vendor information, facilitates payments, and creates a reconciliation file back to your ERP system. 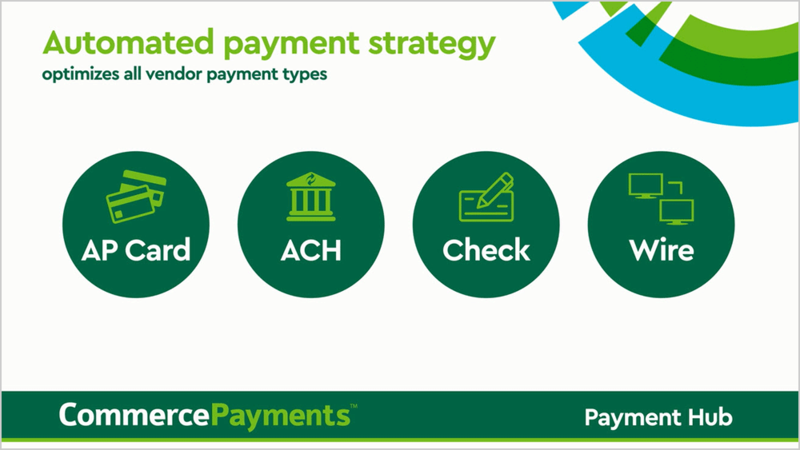 Gain the ability to create a revenue generating payments mix by optimizing all your suppliers’ payment types. The Payment Hub portal interfaces with your existing accounting system, helping you create an automated payment strategy that saves your company time and money. From this single payment file, suppliers can be paid in their preferred method: AP card, ACH, check or wire. Payment Hub even allows your company flexibility to pay suppliers through proprietary payments types outside traditional payment methods. Additionally, Payment Hub maintains supplier information and creates a reconciliation file back to your ERP. By outsourcing time-consuming supplier payments, your employees can focus on building a strategic, revenue-generating AP department while reducing payment fraud at your organization. Our dedicated Supplier Enrollment team will get your program up and running by contacting and enrolling suppliers in the payment option of their choice. This team will work to maximize electronic payments to boost your monthly revenue share potential.